Shall we have turkey or Beef Garland this year? Christmas is coming, and it’s time for the supermarkets to reveal their utterly perplexing range of seasonal food. 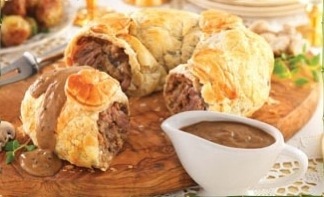 Leading the pack this year is Iceland’s Beef Garland, essentially a toroidal cross between a sausage roll and a Beef Wellington, but without any of those complicated-sounding ingredients normally associated with nice-tasting food. There’s loads of pastry though, so it’s a bit like going to Gregg’s. And kudos to Iceland for giving it such a straightforward name, descriptive in a Ronseal kind of way, yet vaguely seasonal, whilst skilfully avoiding the use of the word ‘bayonet’. I’m not sure whether the nation’s collective culinary memories are deeply rooted in the beef garland – maybe this is simply a tradition that didn’t get as far as my house – or are likely to be sourced from there in the future. Like so many current culinary inventions, it seems to have been invented by putting a thing inside another thing. After all there has hardly been any looking back since Pizza Hut decided to put hot dog sausages in their pizza crusts. However did we get through mealtimes when there was nothing but bread at the edge of our meat feast? 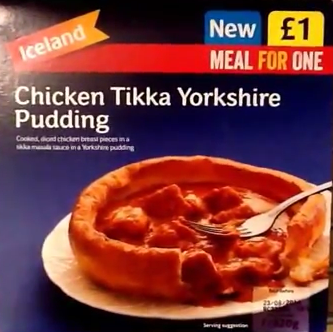 Somewhere else, probably (let’s be honest) Asda or Morrison’s, is offering a twist on a classic three bird roast. They’ve actually created a ‘three fish roast’. A fish, stuffed inside a fish, stuffed inside another fish. Merry Christmas, we’re not having turkey, I’ve done us a piscine abomination. Given that a fish takes about 10 minutes to cook and is unlikely to be enhanced by proximity to other fish, the three fish roast is decidedly not a thing. For vegetarians, they are presumably offering the holy trinity of quorn sausages, quorn pieces and quorn mince stuffed and roasted inside a pair of old tights. And which festive get together wouldn’t be complete without a fully non-ironic spread of canapes? This year’s bang-on-trend orange food is the fish, chip and mushy pea bite, or perhaps a very small burger, or an outré fish finger sandwich. Small burgers have been rebranded ‘sliders’. Next year sliders will be back in a turkey and cranberry sauce variant, stuffed inside a pizza crust or wrapped around a beef garland for that ultimate Christmas treat.